DELAWARE, Ohio – You’re invited to join the Bishop Backers on Feb. 16 for Winter Community Day 2019, a free Delaware celebration held in Ohio Wesleyan University’s Branch Rickey Arena and Gordon Field House, 105 S. Sandusky St., Delaware. During the Bishop Backers event, both the OWU women’s and men’s basketball teams will take on the Big Red from Denison University. The women’s game will tip off at 1 p.m., preceded by members of the Delaware Community Chorus singing the national anthem. 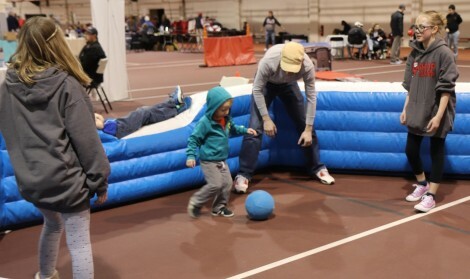 The men’s game will follow at 3 p.m.
An indoor children’s play area courtesy of the Delaware Community Center YMCA. A visit from Columbus Zoo and Aquarium animal ambassadors from 2:15-3:15 p.m. Dogs to pet and adopt from the Humane Society of Delaware County. A chance to meet OWU varsity athletes. Free raffles for prizes including a Phillips 55-inch Ultra 4K UHD TV from Walmart. Community Day is intended to bring people together for a free afternoon of entertainment and education, building on the strong sense of cooperation and collaboration that makes Delaware such a great community. 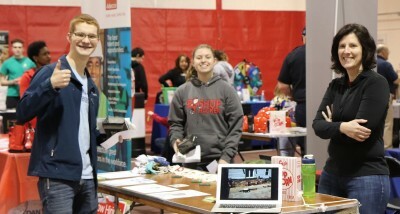 The expo also will help businesses and community service organizations connect with potential customers and volunteers, including Ohio Wesleyan students and alumni. Those wishing to have a table at the expo are asked to register before Feb. 4. Registration is free for nonprofit organizations. For-profit businesses are asked to contribute a minimum $10 gift card to be used for event raffles. Registrants will be provided with a table and two chairs. Electronic expo registration forms are available online at www.owu.edu/BishopBackers. The Bishop Backers is an organization of community advocates interested in sharing information about OWU athletics and other events at Ohio Wesleyan and in connecting potential student-volunteers, interns, and employees with local organizations. Founded in 1842, Ohio Wesleyan University is one of the nation’s premier liberal arts universities. Located in Delaware, Ohio, the private university offers more than 90 undergraduate majors and competes in 25 NCAA Division III varsity sports. Through Ohio Wesleyan’s signature OWU Connection program, students integrate knowledge across disciplines, build a diverse and global perspective, and apply their knowledge in real-world settings. Ohio Wesleyan is featured in the book “Colleges That Change Lives” and included in the U.S. News & World Report and Princeton Review “best colleges” lists. Learn more at www.owu.edu.